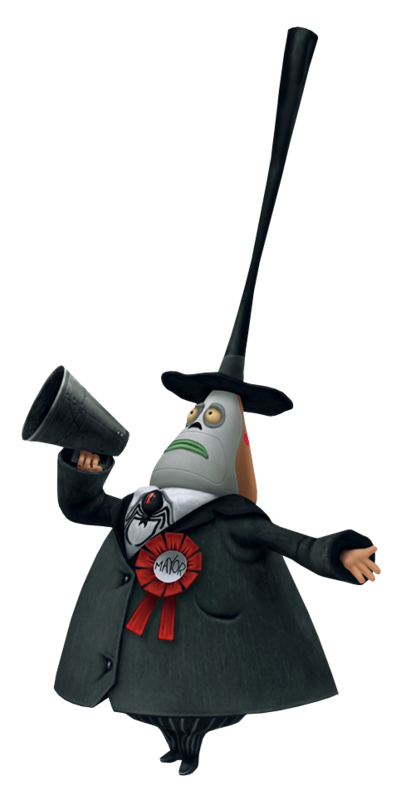 The mayor of Halloween Town, he is, in reality, quite a big coward, even having another face on the back of his head to express his fear and distress and, if given the opportunity, would run straight out of town if not for his position. The mayor looks up to Jack in more ways than one, and doesn't hesitate in going forth to approve whatever the Pumpkin King has in store, so his enthusiasm is certainly not lacking. He and Jack are overseeing the plans for the Heartless Halloween Festival, making sure everything goes according to plan. It is he who notices that the Heartless have begun acting out of control and reverting back to their true nature, as well as he who points Jack and Sora in the right direction when they were searching for the missing Surprise element for the heart they were making. Despite The Mayor's creepy appearance - two faces on either side of his head, which he can turn around at will to express happiness or sadness - this fellow is actually quite the scaredy-cat and will take the first opportunity to run right out of town if trouble arises. He spends his days making preparations for Halloween with his Pumpkin King, Jack, though these are held up quite a few times due to being victimized by pesky Heartless, though he is always saved and left free to continue on his way.